It’s feasible to say that with so many releases having already come our way in 2018, Milestone may well have been the busiest studio out there so far this year. With Gravel and Monster Energy Supercross already released, they’d likely be let off if they told us there was nothing more to come this year. 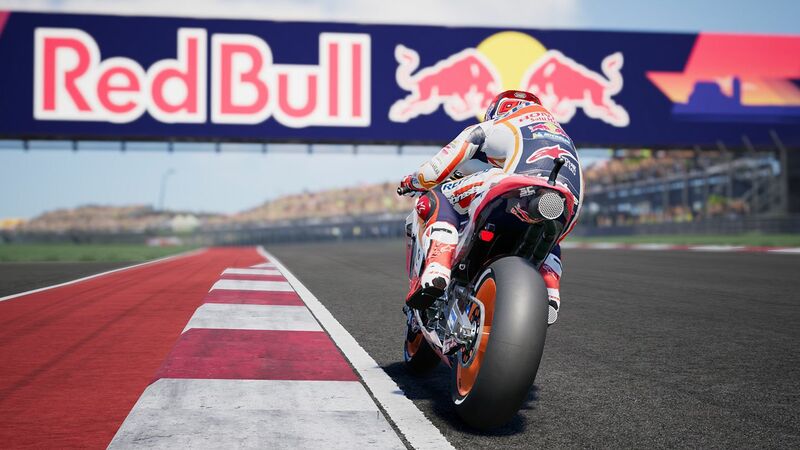 But that’s not the case, and instead, Milestone are cracking on with the latest in the line of yearly releases for the MotoGP series, MotoGP 18. With MXGP Pro and Ride 3 still yet to come from the studio this year though, is MotoGP 18 a worthy update to the series or are we just looking at one of ‘those’ typical yearly releases? So, before we get into the gameplay and all those fanciful details, there’s one important thing to note about MotoGP this year that many fans will applaud given the grumbles from other entries in the series, and that is in regards the game engine. 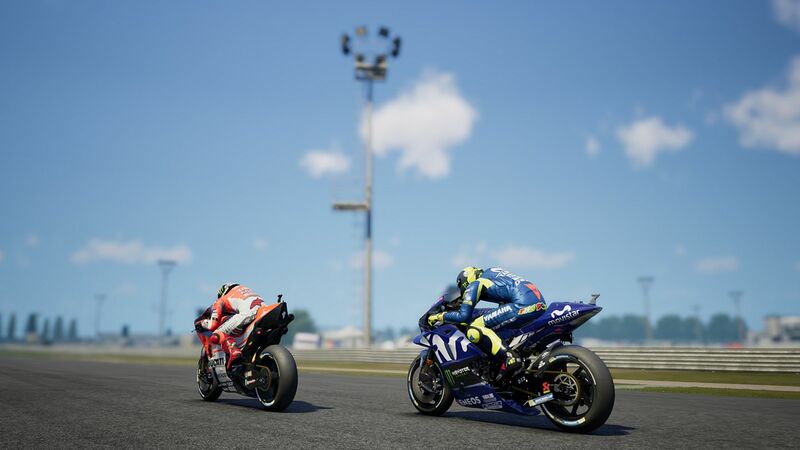 This year Milestone have finally ditched their aging in-house technology for something a little more up-market, with MotoGP 18 brought to us in a somewhat upgraded manner via way of the Unreal 4 Engine. Because of this there are plenty of under the hood improvements that have been made to help make MotoGP 18 the series’ best title yet, whilst drone scanning technology has also been used to help bring us realism at its finest. From the off there are three main ways to play MotoGP 18. First up is the Career mode – a typical entry for the series. But then also attached we find ourselves with Quick Modes, which include the basics for getting straight into things with Grand Prix, Time Attack, Championship and Tutorials all available. The final option – for now – is one which brings about the Online Multiplayer side of things with Matchmaking and Private Races. There is one other mode that players will be able to get involved in later on which is the MotoGP eSport Championship, but access to that is only for the best of the best in the bike racing world, something I don’t think I’ll find myself in once the option opens up. For me, the first stop was the tutorial though, as having missed out on last year’s entry, I needed to make sure I could control my bike out on the track. There are three tutorials to take part in to help players get to grips with the game – Basic, Semi-Pro and Pro. None of them have to be completed, but they all provide the techniques you’ll need if you want to make it to the top of the podium, or at least complete a lap without making yourself look a fool, as each one gives more detailed tips over the last from basic level to pro. After getting a handle on things, you’ll probably find it best to then head in to the mode most will spend the majority of their time with – Career Mode. Career Mode is, as you’d expect, the most in-depth of those in MotoGP 18. To start off, players must first create a rider – for the first time in the series – before choosing from a handful of teams that are competing within the 7-Race Red Bull MotoGP Rookies Cup. Perform well enough here and you’ll grab the attention of teams within Moto3, which will take you to your first full 19 race season. Each of the 19 tracks within MotoGP 18 have been drone scanned to reflect their real-life counterparts to the finest detail and they look stunning to say the least. On top of that more than 100 riders from across each of the MotoGP disciplines are included, meaning you’ll be racing up against real riders at every level throughout your career. Back to the disciplines though and from Moto3 all the way to MotoGP the general idea is the same. You compete in a competitive championship season with the goal of becoming the overall champion. There are extra objectives for players to meet within their teams, such as expected grid and qualifying positions and hitting these is the key to earning contract opportunities to stronger teams within the transfer windows, whilst performing poorly will see you kicked off the team. Another nice touch for the Career mode is the option to tune and upgrade your bike through the development skills. Unfortunately, you can’t physically swap out parts entirely, but you can upgrade your engine, brakes, suspension, aerodynamics, the frame of your bike and so on by way of spending points earnt after each race. There is also a levelling type system that affects your rider with changes to things like riding position and throttle management, but this is something that happens largely in the background after each race. As for the Quick Modes, and these are pretty much like those that you would expect in any racer, and will be the place you’ll want to go to if you’re looking to just get straight into the action. Grand Prix allows a one-off event of your choice, complete with Practice, Qualifying and Race Day. Championship meanwhile allows players to pick a collection of races and compete for points towards a championship title, whilst the Time Attack pits man and machine against the clock as you try to shave off those vital milliseconds to try and break the records of the fastest times out there. They all pretty standard modes and you won’t find much depth in them, but it’s still nice to have them included. One thing that is great to see is that even though MotoGP 18 is all about bringing a realistic MotoGP experience to players, it doesn’t have to be played as a pure simulation experience and you can quite easily tailor the difficulty to how you want. If you crave pure realism then that option is there, with tyre wear, Pro rider physics and a selection of riding aids that can be turned off if you so wish. But if you’re just after the sheer fun of breakneck speeds and the general feel of the game without all that extra difficulty and tension, then you can have all the driving aids and even some of the rules off if you wish… all of which can lead to a much simpler experience. As for the online option, MotoGP 18 isn’t exactly overly populated, but even with a few players, the game is still great online thanks to the inclusion of A.I racers to fill in the gaps, with the host able to select the difficulty of the A.I opposition. It’s a very simplistic online mode and there are no rankings beside your own individual levelling up – which doesn’t seem to affect much besides showcase how much time you have put into the game. Besides the game modes, the only other thing left to talk about are in regards the controls and visuals. 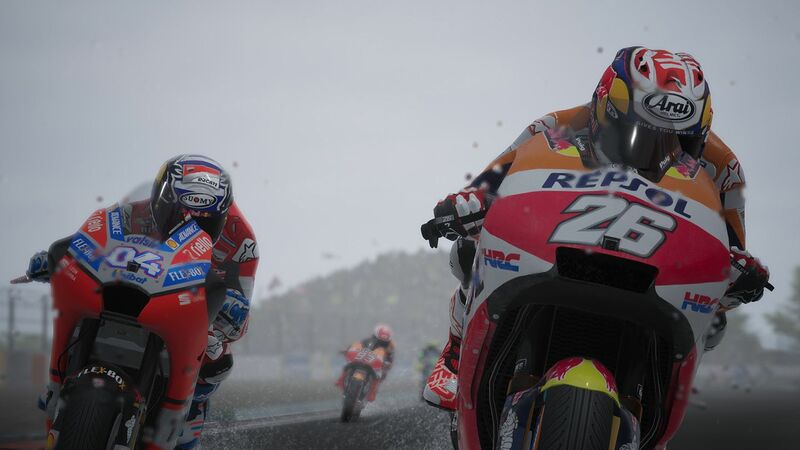 With the latter in mind, the game is phenomenal and with Unreal Engine 4 now powering the MotoGP series, things look better than ever before. As for the controls and the general feel of the bikes, and well, it’s fair to say things are spot on there too. Every bike feels weighted as you’d expect from a superbike and with controls proving responsive, there’s hardly anything to complain about. Even in wet conditions, the bikes all feel and handle as you’d expect, whilst night racing can see tyres lack grip due to the track not being warm enough. 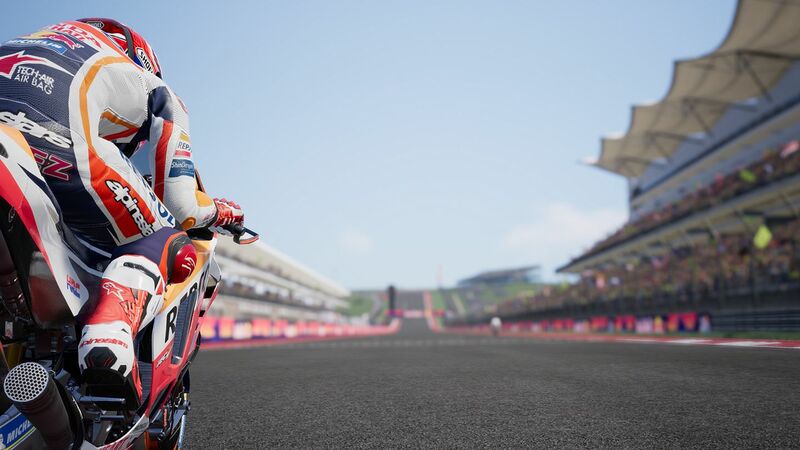 Overall though, those who are used to what is found in Milestone’s other bike racing series, RIDE, will feel totally at home with the feel of MotoGP 18. So at home in fact that anyone looking to get involved in the MotoGP experience would be wise to pick up this year’s entry. Whilst things still seem quite similar to previous entries, there are some subtle changes that certainly improve upon things and with a decent experience all round, there’s little to fault. It may well be hard to wave the chequered flag at a £50 price point, but this is still a game you should be getting involved in if you’re a fan of bike racing.